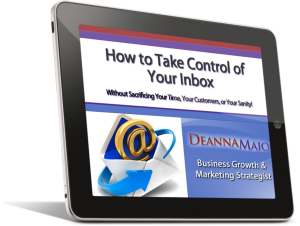 "Learn How to Take Control of Your Inbox without Sacrificing Your Time, Your Customers, or Your Sanity!" If you’re struggling with managing email and keeping your inbox under control, then you’re about to be extremely happy. If you’re like most people, you have a love/hate relationship with email. You love its convenience. You love how easy it is to use. You love that it’s free – or at least costs a lot less than a stamp. But you hate how much control it has over your life. You’re constantly checking email, and why not? It’s on your computer, your iPad, and even your phone. You are never more than a few steps away from checking (and responding to) your email. And somehow, we’ve convinced ourselves that this is normal! 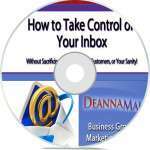 This Is Your Chance To Take Control of Your Inbox! You see, I’ve discovered a way… that only takes 30 minutes… to get and keep your email inbox under control. Stop obsessively checking your email – without disappointing your customers, friends, or yourself. Control your inbox so you stop missing important emails and stop being stressed over that “unread” count. Effectively manage multiple email addresses without losing your mind. Know when email is not the best tool – and what to use instead. Manage your email in just 30 minutes a day! 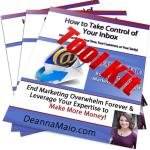 You can learn to control your email and you can recover from email overwhelm. As you know, the way everyone else tells you to fix email management simply DOES NOT WORK. To effectively manage email you’ve got to learn a specific, simple system to process it on a regular basis as a part of your schedule. You can’t keep “checking” it because it becomes an interruption, taking your attention away from other more important, revenue-generating activities. When you change how you schedule and address email in your business, you become more productive and focused on the most powerful things in your business. All you have to do is find that step-by-step system, learn it, practice it, schedule time, keep that schedule, avoid distractions during your “email time” and set appropriate boundaries with people who are used to getting you at every moment of the day via email. I know this might sound like a lot to chew. It’s why I decided to put everything together in a program that you can take advantage of. I know you want to get your email under control once and for all… and so I wanted to do my best to help. 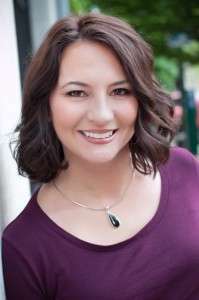 I created “How to Take Control of Your Inbox” when I saw how many business owners were dealing with overwhelming amounts of email and no system to manage it all. And judging by all the feedback I’ve already gotten, I’m quite confident it can help YOU too. After all…if you just free up one hour a month and use that hour to sign up a new client, launch a new program, or secure a new JV partner, we’re talkingabout thousands of dollars in more revenue and a whole lot less stress. I’m not saying I’ll keep it at this price forever though. Most experts charge would charge $197 for this kind of solution and it’s been on the back of my mind. If for any reason “How to Take Control of Your Inbox” doesn’t work out for you… all you have to do is let me know within 30 days of your purchase and I’ll promptly refund all your money. For those of you who mostly have time to listen, you’ll get access to the video training that you can watch, pause, take notes, and repeat whenever you want. For those of you who mostly have time to listen, you’ll get a downloadable Mp3 audio that you listen to in the car while traveling or driving the kids around, or even while working out or doing household chores. Since reading is still the number one preferred method of learning, you’ll get a PDF transcript of the workshop so that you can print them off and read through them again and again. To save you time and give you something to work from, you’ll get access to 2 powerful worksheets. As soon as you sign up you’ll get instant access to everything I mentioned – the video training, Mp3 audio, the transcript and the toolkit. Once your order goes through, you’ll be redirected to a page that tells you exactly how to get started. YES, Deanna! Count me in! P.P.S. Don’t miss out — secure your copy now! Your purchase of my program comes with comes with my no-risk, 100%, unconditional money-back, 30-day guarantee! 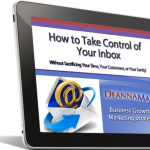 My program will help you develop a streamlined system for handling your email. But if, at any time during the next 30 days, you don’t feel it makes good on my promise, or helps you in any way, confidently ask for an refund. Email management is one of those skills they don’t teach you in school, but which everyone must learn in order to be truly successful. Don’t let this opportunity to develop your own comprehensive email management system pass you by. It’s tough to face all the demands on our time. Family, friends, jobs, and other obligations are constantly pulling at us, causing stress and leaving little time for our own money-making projects. But once we learn to truly manage the time we have, it’s amazing what we can accomplish. Grab your copy of this informative, easy-to-read report today, and learn the real power time management can have in your business.